Recently with a little spare time on my hands, I took the opportunity to view some old video tapes of various individuals performing open hand and weapons katas. As I was watching a noted Shorin-ryu practitioner perform some of his weapons forms, the TV screen went blank. As I fast forwarded the tape, an image came on the screen that was not anticipated - I found myself watching the formal ceremony held at the HKA for Master Odo's 10th Dan recognition by the Officers and Senior Yudansha of the Okinawa Kenpo Karate Kobudo Federation (OKKKF) in 1990. At the end of this historic footage, I was again surprised as I found myself watching my promotion to 8th Dan that was made by Master Odo at the OKKKF Annual Training that same year. I have been able to save the old VHS Tape footage to a digital format so we all can have the opportunity to view these two events from the past. 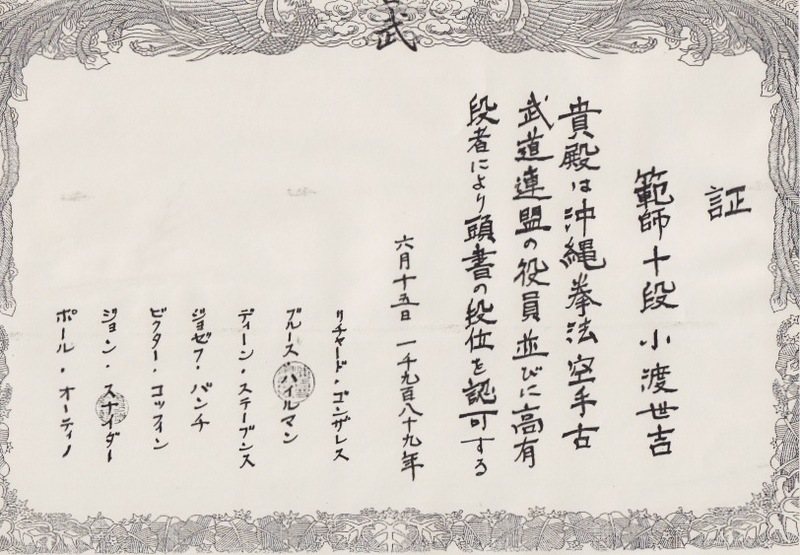 Before the 1989 OKKKF Annual Training, members of the OKKKF received exciting notice from the Okinawa that Master Seikichi Odo had been granted a promotion to 10th Dan. At the OKKKF Annual Training held that summer in Reading, Pa., Master Odo was presented with a Plaque commemorating his elevation to 10th Dan. 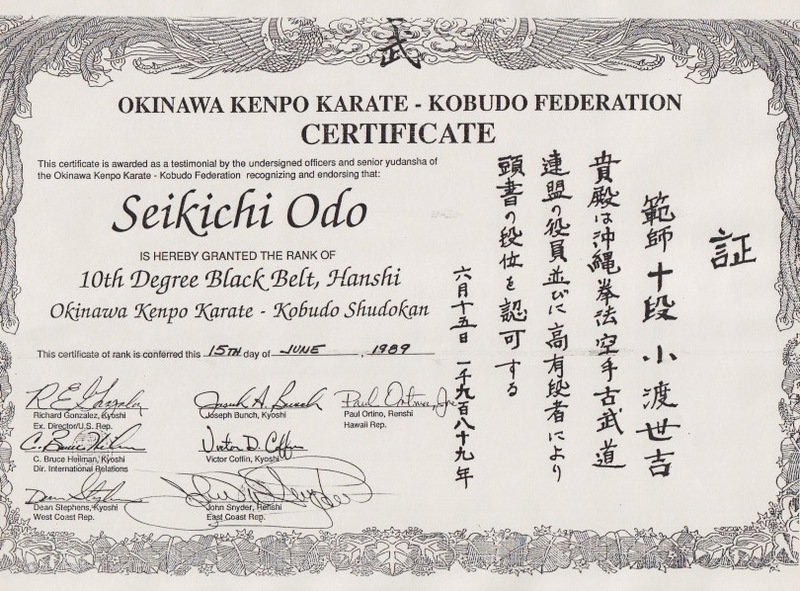 During that training event, the senior members and officers of the OKKKF discussed their desire as his students to formally recognize Master Odo as a 10th Dan and head of the OKKKF and the Okinawa Kenpo Karate Kobudo Shudokan System. This came to reality during the 1990 OKKKF Annual Training at which two Certificates of Recognition (one in English and one in Japanese) were formally presented to Master Odo. Although the Recognition Certificate was presented to Master Odo in 1990, it was back dated to 1989 to coincide with Master Odo's promotion the year earlier. Additionally, a separate 10th Dan Recognition Certificate from the United States Karate Alliance was also presented to Master Odo. Please click the following link to view this historic footage. Additionally, I have also included pdf's of the three Recognition Certificates that were presented to Master Odo as shown in the historic footage. 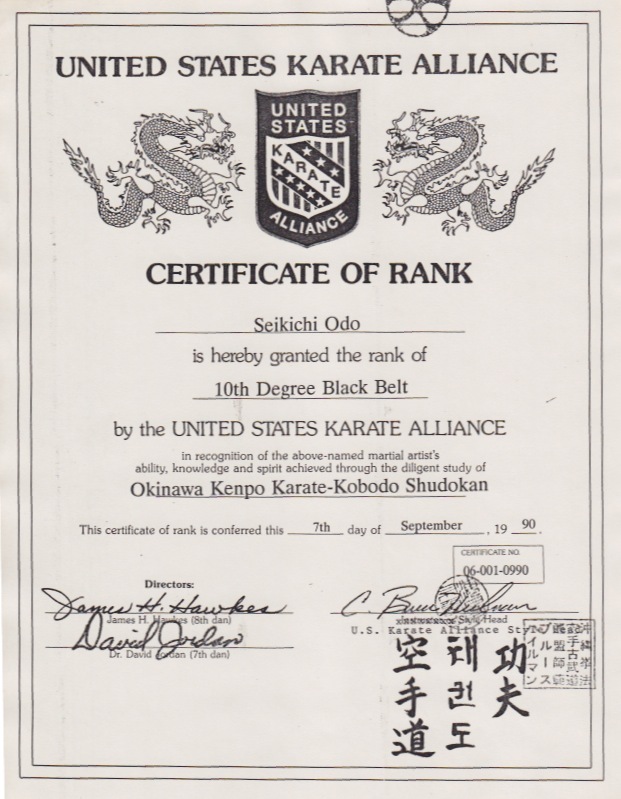 At the 1990 OKKKF Annual Training held in Reading, Pa., Mr. Heilman had the honor of receiving a promotion to 8th Dan in Karate and 8th Dan in Kobudo directly from Hanshi Seikichi Odo. Hanshi Heilman is excited to have found both of these historic archive videos. In particular, the footage of Master Odo's 10th Dan Recognitions is an important part of our Okinawa Kenpo history and one that we can now share with fellow Okinawa Kenpo practitioners.